Help! I’m Not Equipped to Homeschool! Feeling like you are being called to homeschool, but don’t feel equipped? Or are you in the midst of homeschooling and feel like you just can’t go on? Have no fear. If God has called you, He will equip you! Join me as we talk about all these things and how I have learned to overcome. You may not be equipped, but God supplies the equipment! Want to be encouraged some more on your journey? Get me books! When I began this journey, now 10 years ago, I had no idea the amazing places God would take me. Not physical places mind you (although we’ve done quite a few awesome field trips!) but I mean places that He has led me—such as joy-filled places, despair-filed places, places where I have laughed, places where I have cried—just so many different emotional places. Yet one place He has taken me to that has been a necessary one, is on my knees in prayer. I have learned over the years that I do nothing without Him. I would not have started this journey if I had not submitted to His plans- even when it seemed absolutely impossible for ME to homeschool, I prayed so much that year, and He lead me to start homeschooling. I am eternally grateful that I kept a journal that year. It has provided a written testimony of all that He has done. I highly recommend doing so. A prayer journal may not only bless you now, but your future self will thank you. When I look back over journals and I see the prayers answered and how God works, it is incredibly encouraging. It blows my mind to see myself in my writings from 10 years ago…a terrified mom with no idea what she was getting into, but she was listening and obeying God. I am so thankful I still have those journals! There have been times of big prayer. Really big prayers. Where things have seemed so impossible and I was driven to my knees. There were times of great joy. Where I couldn’t help but praise Him for all He does and for who He is! And there was weekly prayer over our homeschool plans. That to me is a must do for all homeschool moms. How can we expect our plans to succeed if we don’t include Him? Pray over your plans each week. I try to spend time on Sunday night reviewing the week before and submitting my plans for the week ahead to the Lord. Seriously, though it was a game changer for me and how I look at prayer. The battle is HIS, and we are to step aside and let Him work, but we still must GO to Him in prayer. Really, your War Room can be anywhere- a closet, a spot on your porch, or a bench made out of stones 😉 . The important thing is we must be on the offensive and pray! May we remember that our homeschools should be covered in prayer. Daily, weekly, and moment by moment. Back to School Giveaway and SALE! ALL participants receive a FREE Notebooking Pages sampler. 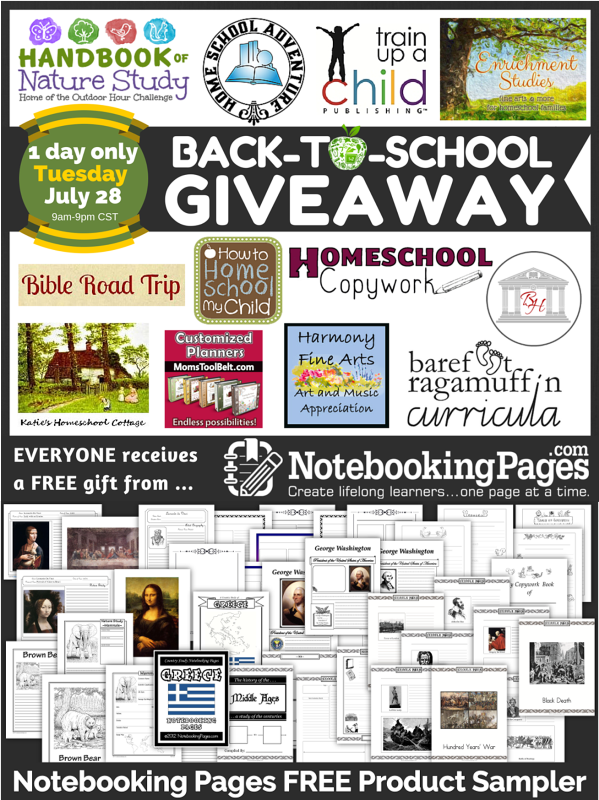 Author Karen DeBeusPosted on July 28, 2015 Categories UncategorizedLeave a comment on Back to School Giveaway and SALE! Head over to Mama Goes Frugal to download this FREE Complete homeschool preschool curriculum that is 300 pages! Look What I Can Do! also features a terrific picture book list, coordinated to the curriculum lessons. BIBLE: We are doing an Advent devotional, and the kids are copying Luke 2 for copywork. MATH: Math U See: Algebra for the oldest (pray for us! 😉 ) Delta, and Zeta for the others. Littlest guy is practicing counting, order, calendar, and writing numbers. HISTORY: We are continuing in Mystery of History. We are reading about Ancient Rome and Christian persecution. We read through a lesson, and then took another day to do some of the activities for the lesson. We had to talk about how Rome was divided up into provinces to make it easier to rule by Diocletian. So we were able to then do activities relating to how our country is divided into states. We spent one day using flashcards to review the states and capitals. The older children had to then research what a governor does and write me a short paper about their duties and limitations of power. SCIENCE: Apologia for all children. This is a great Bible-based curriculum. Plus lots of real life science on our new property! Salamander catching, exploring in the woods, nature, and more! LANGUAGE ARTS: Explode the Code for younger children, Language Lessons from Sandi Queen for older, and IEW for oldest. My oldest is working a report writing with IEW. We absolutely love that program! There have also been a few writing assignments for the younger children. READING: Oldest is reading Crazy Love by Francis Chan and Across Five Aprils. Middle schooler is reading Narnia series, and younger is reading a fishing book (he loves fishing!) Littlest is learning to read with Explode the Code and I can Read It. FOREIGN LANGUAGE: French using Middlebury Interactive for oldest. Several years back we studied the Pilgrims for a long time. We just got stuck on this time period because it was so fascinating to read about these people who risked everything and suffered for a cause many of them would never even come to see to fruition. Amazing testimony of faith. Our studies culminated with a trip to Plymouth, MA to visit Plimoth Plantation and the Mayflower. It was truly amazing. With Thanksgiving upon us, here are some resources to learn about the Pilgrims. Of Plymouth Plantation 1620 – 1647 – One of MY very favorites. I read this after visiting Plimoth Plantation and just loved it. One of the best things we ever did was visit Plimoth Plantation in Plymouth, MA. We visited late September when the crowds were gone and the weather is perfect. I highly recommend visiting if you can. After learning about the Pilgrims, when we actually visited Plimoth Plantation, it was amazing to step back in time and visit life there. Preposterous! That old-fashioned word sums up the responses I received from my gallery of naysayers when I announced, as a single mom of two small boys, that I wanted to homeschool my children. The naysayers were comprised mostly of family and friends. Strangers were more likely to affirm my desire. One friend rejoiced and affirmed my announcement. One. Does that surprise you? It surprised me. Until I realized that strangers don’t have a deeply held desire to see me succeed. Strangers can afford to be encouraging of a not-so-typical dream. Family and friends want me to be safe. Why is it that tradition seems so safe? I once told my dear, worried mom just before she died, and now often tell my children, that the safest place we can be is where God wants us to be. Even if we die doing His bidding, we are safe. God planted the seeds of faith for foster care, adoption, and homeschooling when I was quite young. Even my typical childhood and not-so-typical rebellious, tumultuous, young-adult years didn’t squash the seedlings. At His appointed time, my hardened heart softened. To me, it seemed the journey to my destiny had commenced, but truthfully, it had already begun before I was born. Praise HIM! The short answer is: I don’t do it. GOD does! To me, the journey has been an unpredictable adventure with joy, peril, sorrow, pain, uncertainty, poop, gain, loss, laughter, tears, delight, pleasure, fear, barf, spontaneity, abundance, noise, contentment, imperfection, loneliness, poverty, provision, rejoicing, hellos, good-byes, respite, exhaustion, and peace. By the world’s standards, there’s nothing safe at all about this journey. But what a glorious adventure with Jesus it is! Before I ever asked God to give me the desires of my heart, before I even knew what I needed and wanted, God planted the seeds of faith that gave birth to the desires now being fulfilled and lived out through the touch of His good and loving hands. This truth overwhelms my heart with joy! To God be all the glory forever! Debi is a still-single, homeschooling momma of 6 children given to her by God through the amazing journey of foster care and adoption. She has been homeschooling for 9 years and is looking forward to many more years of home education. She spends her days walking by faith and living out the command to teach her children when they lie down, rise up, and walk by the way.